In our need-it-yesterday world, a one-size-fits-all mentality can be incredibly efficient… provided a product genuinely does fit “all.” However, problems appear when that concept is stretched a little too far, into areas where one size definitely does not fit everyone and everything. Our beds are one such area. Everyone knows our bodies are completely unique, with different shapes, sizes, wants, and needs. Despite this, mattresses are still routinely offered with minimal variation. 100 different bodies can have 100 different sets of comfort and support needs, yet traditional mattresses rarely offer more choice than “soft” or “hard.” See the disconnect? Fortunately for people who are on a quest to get a bed that’s better than “good enough,” foam mattress layering offers the opportunity to build a completely personalized bed in an incredibly easy way. And at The Foam Factory, you can find everything you need to get a custom mattress that will make you feel like the only pea in your very own pod. Many people are familiar with foam mattresses as thick slabs of squishy foam. In this form, foam mattresses have existed for years, but they essentially had the same problem that traditional mattresses still do: there are only a handful of varieties of foam, while there are millions of people with completely different comfort needs. 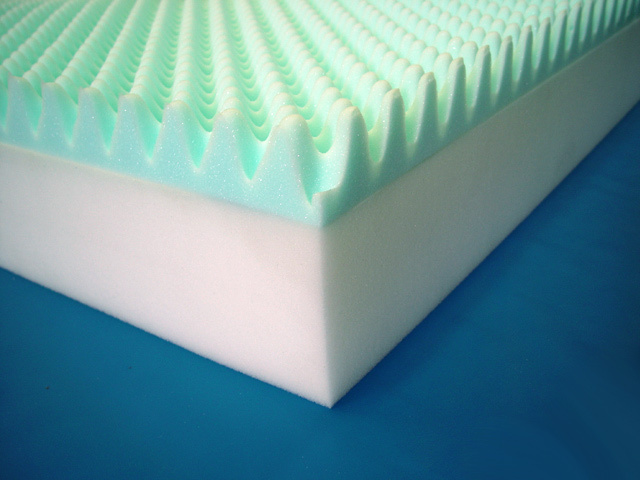 Today, with the popularity of the foam topper, full foam mattresses have followed suit and are now offered with layered builds. The Foam Factory is one of those companies giving people the opportunity to finally have the perfect bed, offering layered mattress options in conventional foam, latex foam, and memory foam varieties. The combinations possible with foam materials means common firmnesses and densities can be blended together to create a unique feel that would cost substantially more to formulate and manufacture as a single foam slab. Stocking the usual foam offerings in thinner layers means the same standard materials are still being produced, but with the ability to turn them into something completely unique – a solution that works for both manufacturers and customers! A typical layered mattress build usually consists of two or three sheets of foam, with the bottom often being a thicker “base layer,” while thinner comfort layers build off the support of the base beneath. 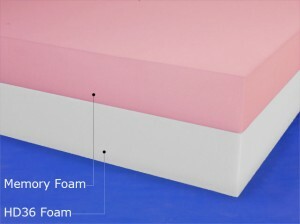 The Foam Factory offers all of their comfort foam varieties in sizes that can be built into the perfect mattress for you, including six varieties of conventional open-cell foam, three densities of temperature sensitive memory foam, 100 percent all-natural Dunlop latex mattress foam, and even fast-drying outdoor and marine foam. While individual layers of mattress foam are usually suggested to be a minimum of 2-inches thick, The Foam Factory offers both their Dunlop latex and conventional foam in standard mattress sizes as thin as 1-inch for special uses, with their memory foam starting at 2-inches. With these sizes and options, the combinations are limitless for building the perfect mattress. Another benefit of a custom layered mattress is how easy it to physically assemble it. The foam sheets that make up a layered bed don’t require individual covering or any adhesives or bonding agents. Once you purchase your foam layers, all you have to do is stack them atop each other in the order you prefer. No messy gluing, or expensive custom covers needed! The benefit here is two-fold; without gluing these layers together, a bed is much easier to relocate or move with if you’re able to do it one layer at a time. Also, if your comfort preferences ever change, you can rearrange the layers in your mattress to get a new feel. Essentially, a layered foam mattress is like multiple beds in one! If you know you need a unique layered mattress but aren’t sure where to start, The Foam Factory can help you build the best mattress for you. Knowing what you’ve tried before and what has and hasn’t worked for you gives their experienced sales team all the background they need to make sound suggestions for foam combinations that will work well for you. For some great ideas on custom mattress builds, check out our next post: Thinking About a Layered Foam Mattress? Check Out Some Build Examples! Link to our conventional foam mattresses is here. Link to our covers is here.